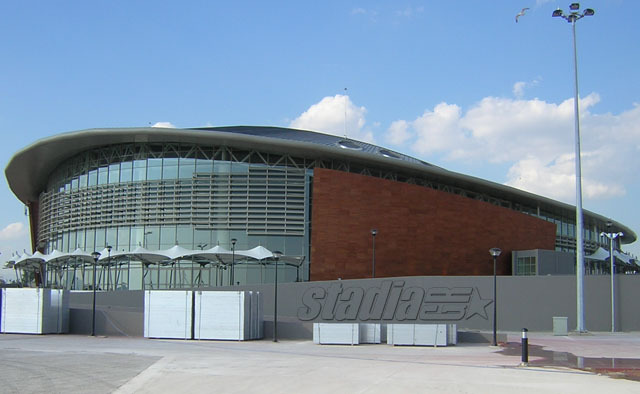 Location: The arena is located on the Faliro coastal zone, 8 km south of Athens. Coming from the city centre, you will find it right where Syngrou Avenue gets to the seafront and splits in two. To get there by public transport, use the tram (lines 1 or 3) and get off at "Delta Falirou". See a map of the area (the arena is marked as #6). You may also view a photo that was shot from the arena and shows all other sports installations along Faliro Bay that were used in the 2004 Olympics (Peace & Friendship Stadium, Karaiskaki Stadium, Beach Volleyball Centre). 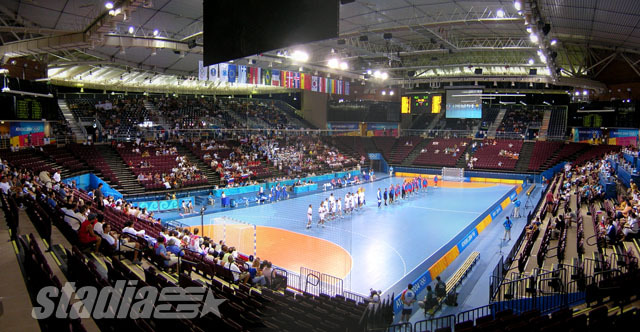 More data: This brand new arena hosted the sport of tae kwon do, as well as all handball preliminaries during the 2004 Athens Olympic Games. Ôhe upper tier of stands was temporary and was removed after the Olympics (compare the two above photos). The lower tier can also be retracted, leaving 3,700 sq.m. of free space. 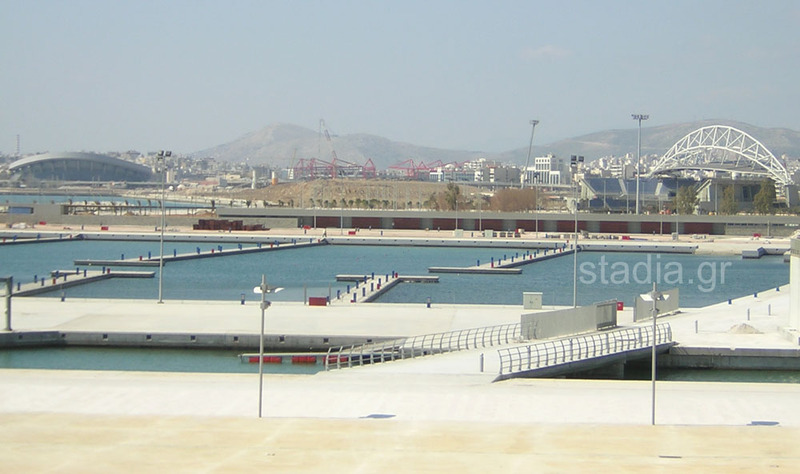 Having this in mind, it is easy to understand why the Greek State aims to transform Faliro Arena into the Athens Metropolitan Convention & Exhibition Centre. Faliro Arena was designed by architects "Thymios Papagiannis and associates". Works for its construction commenced in June 2002 by BIOTER SA. They were completed in March 2004 at a cost of about € 38 million. 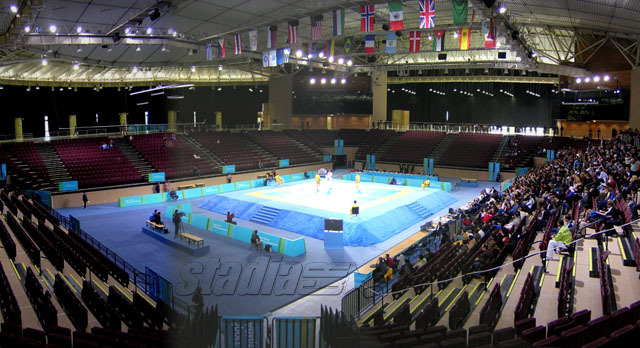 The new arena was inaugurated on 13 March 2004, during the "Faliro 2004" International tae kwon do Tournament. 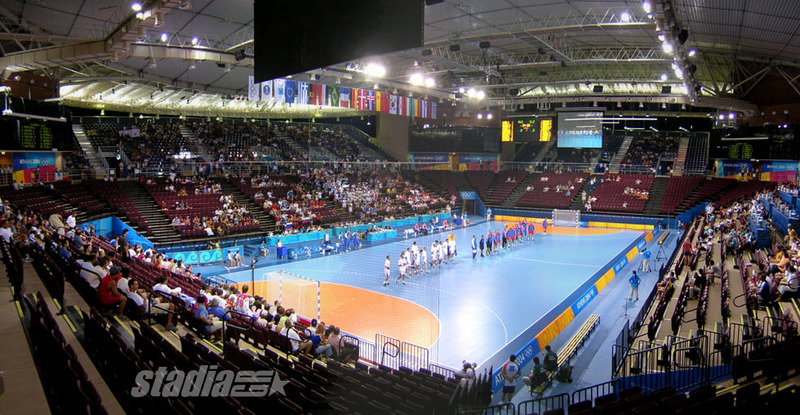 The new Faliro Arena has been nicknamed "the small Peace & Friendship Stadium". Both arenas have distinctive curved roofs, while they also lie on the same coastal stretch of land, occupying the two ends of Faliro Bay. Finally, you may see renderings and plans of the arena that were publicised some years ago, helping you to make the comparison with the "final result". 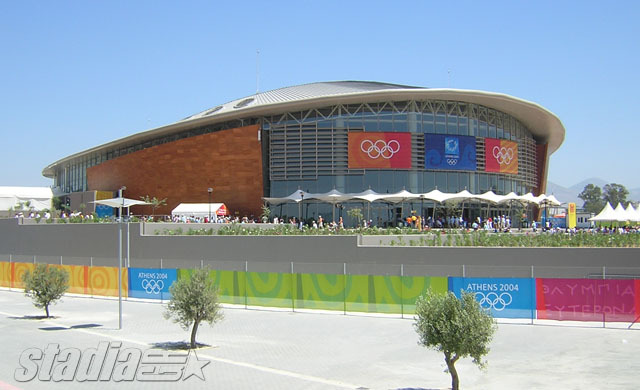 Faliro Arena is owned by Olympic Real Estates S.A.